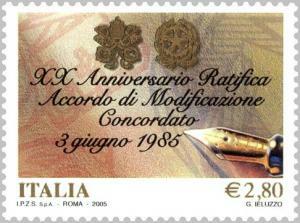 Signed by the Italian Republic and the Holy See on 18 February 1984. Ratified by the Italian Parliament on 25 March 1985. The Italian Republic and the Holy See reaffirm that the State and the Catholic Church are each in their own way independent and sovereign and committed to this principle in all their mutual relations and to reciprocal collaboration for the promotion of man and the good of the Country. 1. The Italian Republic recognises the Catholic Church’s full liberty to develop its pastoral, educational and charitable mission, and to evangelize and to sanctify. In particular the Church is assured the freedom to organise its affairs, to exercise public worship, to carry out its teaching and spiritual ministries, as well as to exercise its jurisdiction in ecclesiastical matters. 2. Equally assured is the reciprocal liberty of communication and correspondence between the Holy See, the Italian Bishops’ Conference, the Regional Bishops’ Conferences, the Bishops, the clergy and the faithful, and likewise the freedom to publish and disseminate its acts and documents relevant to the mission of the Church. 3. Equally assured to Catholics and to their associations and organisations is the full liberty of assembly and to express their thoughts orally and in writing, and by any other means of circulation. 4. The Italian Republic recognises the particular significance that Rome has for the Catholic community, as the Episcopal See of the Supreme Pontiff. 1. Diocesan and parish districts are wholly determined by ecclesiastical authorities. The Holy See undertakes not to include any part of Italian territory into a diocese whose Episcopal See is part of the territory of another State. 2. Appointments to ecclesiastical offices are wholly made by ecclesiastical authorities. The latter will inform the competent civil authorities of the appointments of Archbishops and diocesan Bishops, of Coadjutors, of Abbots and Prelates with territorial jurisdiction, including parish and other official appointments to ecclesiastical offices relevant to State administration. 3. Except for the diocese of Rome and the suburban dioceses, ecclesiastics who are not Italian citizens shall not be appointed to offices mentioned in this particular article. 1. Priests, deacons, and those who have taken religious orders have the right, at their request, to exemption from military service or to be assigned forms of alternative civil service. 2. In case of general mobilization, ecclesiastics who have not been assigned to pastoral duties shall be called to exercise religious ministry to the troops or, subordinately, they shall be assigned to medical services. 3. Students of theology and those in the last two years of their preparatory theological studies and novices of religious institutions and societies for the apostolic life may avail themselves of the same rights to postpone military service as accorded to students of Italian universities. 4. Ecclesiastics are not required to divulge to magistrates or to any other officials in authority any information on persons or matters made known to them through the exercise of their ministry. 1. Buildings open for worship cannot be requisitioned, occupied, expropriated or demolished save in exceptional circumstances and by prior agreement with the relevant ecclesiastical authorities. 2. Except in emergencies, the police force shall not enter places of worship in the pursuance of their duties without prior notification to the ecclesiastical authorities. 3. The civil authorities will take account of the religious needs of the population as advised by the relevant ecclesiastical authorities with regard to the construction of new places of Catholic worship and the pertinent parish structures. The Italian Republic recognises as public holidays all Sundays and other religious festivals as determined by agreement between the Parties. 1. The Italian Republic, in accordance with the principle noted in Article 20 of the Constitution, reaffirms that the ecclesiastical character and the religious end and the purpose of worship of an association or institution cannot be subjected to special legislative limitations, neither to special taxes with regard to its constitution, legal competency or any other form of activity. 2. The legal status previously conferred upon ecclesiastical bodies shall stand and the Italian Republic, at the request of the ecclesiastical authorities or with its consent, shall continue to recognise the legal status of ecclesiastical bodies whose See is in Italy, who have been set up and approved according to the norms of Canon Law and have a religious or devotional purpose. The same procedure shall be followed for the recognition of civil effects for any substantial change to the same bodies. 3. With regard to taxation, ecclesiastical bodies having a religious or devotional purpose, as well as activities directed to that same goal, are to enjoy the same benefits as those which have a charitable or educational purpose. Activities which differ from those of a religious or devotional nature, developed by ecclesiastical bodies, are subject, in respect of the structure and goal of such bodies, to State taxation laws in the same manner as is prescribed for the aforementioned bodies. 4. Buildings open for worship, publication of acts, the posting of notices inside and at the entrance of places of worship or ecclesiastical buildings, and the collections made in the aforesaid buildings, shall continue to be subjected to existing legislation. 5. The administration of property belonging to ecclesiastical bodies is subject to the controls as laid down in Canon Law. However, the acquisitions of these bodies are also subject to controls laid down in Italian law on acquisitions made by legal persons. 6. Upon signing this present Agreement, the Parties shall institute a joint Commission to draw up norms, which will be subject to their approval, for the regulation of all matters of ecclesiastical bodies and their properties and for the revision of financial obligations of the Italian State and of the intervention of the latter into the management of estates owned by ecclesiastical bodies. As a temporary measure and until new regulations come into force, Article 17, paragraph 3, and Articles 18, 27, 29, and 30 of the previous text of the Concordat remain in force. 1. Civil effects are recognised of marriage contracts made according to Canon Law, provided that a marriage has been registered in state registers and notification has been previously published in the local registry office. Immediately after the marriage, the parish priest or his delegate will explain to the contracting parties the civil effects of marriage, by reading the articles of the civil code regarding the rights and duties of married people and he shall draw up in original duplicate copies the marriage deed in which the spouses’ declarations permitted according to civil law may be inscribed. b) there is an impediment between the spouses which the civil law considers to be insurmountable. However, marriage registration is allowed when, according to the civil law, grounds for annulment can no longer be maintained. The application for registration is made in writing by the parish priest in the place where the marriage is to be celebrated in no more than five days from when the marriage is to take place. The state registrar, having satisfied the conditions for the registration of a marriage, shall record the request within twenty-four hours of receiving it and shall give notice thereof to the parish priest. The marriage has civil effects from the moment of its celebration, even if the state registrar, for whatever reason, has made the registration after the prescribed term. The registration of marriage can also be made subsequently at the request of the two spouses, and even at the request of one of the same, with the knowledge and full agreement of the other, providing they have maintained single status from the moment of the marriage celebration until the request for registration has been made, and without prejudice to the rights legally obtained by any third parties. c) that other conditions required by Italian law for the efficacy of foreign judgements are in place. The court of appeal shall be able, in a judgement which intends to execute a canonical judgement, make provisional economic measures in favour of one of the spouses for whom the marriage has been declared null, referring the parties to a competent judge for a final decision on their case. While assenting to the present law on matrimony, the Holy See feels the need to reaffirm the immutable value of Catholic doctrine on marriage and the concern of the Church for the dignity and values of the family as a fundamental element of society. 1. The Italian Republic, in conformity with the principle of the freedom for schools and teaching and within the terms set down in its Constitution, guarantees to the Catholic Church the right freely to establish schools of every order, grade, and educational institutions. To such schools is assured absolute parity and freedom, and the same also to its pupils, who are to receive the same academic equivalence as those in State schools and other territorial bodies, and also insofar as State examinations are concerned. 2. The Italian Republic, recognising the value of religious culture and having in mind that the principles of Catholicism are a part of the historical heritage of the Italian people, shall continue to assure, within the framework of the purpose of schools, the teaching of the Catholic religion in state schools of every order and grade, excepting universities. By way of respect for the freedom of conscience and the responsibility of parents for bringing up their children, the right is granted to all parents to choose to avail themselves or not avail themselves of the aforementioned instruction. Upon enrolment, students or their parents shall exercise this right on request of the school authorities, without their choice being the source of any form of discrimination. 1. Universities, seminaries, academies, colleges and other institutions for ecclesiastic and religious people, or for those training in ecclesiastical disciplines, established according to Canon Law, shall continue to submit themselves exclusively to ecclesiastic authority. 2. Academic degrees in theology and in other religious disciplines, agreed upon by the Parties, and conferred by Faculties approved of by the Holy See, shall be recognised by the State. Diplomas obtained in Vatican Schools in palaeography, diplomacy, archive and library sciences shall likewise be recognised. 3. Appointments of teaching staff at the Catholic University of the Sacred Heart and allied institutions are subject to approval according to a candidate’s religious profile by the competent ecclesiastical authority. 1. The Italian Republic shall assure that service in the armed forces, the police, or in an other similar services, and confinement in hospital, sanatoria or in hospices of public assistance, or permanent confinement in institutions of detention and punishment shall in no way impede the exercise of religious freedom and the fulfilment of practices of Catholic worship. 2. Spiritual assistance to the aforesaid shall be assured by ecclesiastics appointed by the competent Italian authorities by the nomination of ecclesiastic authority and in accordance with state law, the personnel, and the procedures set out in agreements between such authorities. 1. The Holy See and the Italian Republic, in their respective roles, shall collaborate for the protection of their historical and artistic heritage. With the aim of harmonizing the application of Italian law with religious requirements, the competent bodies of both Parties shall agree upon appropriate measures to safeguard, utilize and enjoy property of cultural and religious interest belonging to ecclesiastical bodies and institutions. The conservation and consultation of archives of historical interest and of libraries of the same bodies and institutions shall be favoured and aided on the basis of agreements drawn up between the competent authorities of the two Parties. 2. The Holy See shall retain authority for the care, maintenance, and conservation of Christian catacombs in Rome and in other parts of Italian territory, but shall renounce responsibility of all other catacombs. In accordance with State law and to any rights of third parties, the Holy See shall pursue any excavations necessary and the removal of sacred relics. 1. The above provisions constitute modifications to the Lateran Concordat accepted by the two Parties and shall come into force from the date of exchange of instruments of ratification. Except for provisions in Article 7, paragraph 6, the provisions of the same Concordat not reproduced in the present text are repealed. 2. Further matters on which collaboration between the Catholic Church and the State might arise shall be laid out either by new agreements between the two Parties or by accords between the competent authorities of the State and the Italian Bishops’ Conference. Should any difficulties in interpretation or application of the above provisions arise in the future, the Holy See and the Italian Republic shall entrust the search for an amicable solution to a joint Commission appointed by them. The principle, originally stated in Lateran treaties, that the Catholic religion is the sole religion of the Italian state is no longer in force. a) With reference to Paragraph (2) the following persons are considered to be actively engaged in the care of souls – parish priests, parochial vicars, curates of churches holding religious services and priests permanently employed in assisting in services of pastoral care as referred to in Article 11.
b) The Italian Republic assures that the judicial authorities will give notice to the ecclesiastical authorities appropriate to the location of any criminal proceedings pending against clergymen. c) The Holy See takes the opportunity of the modification of the Lateran Concordat to declare it is in accord, without prejudice to Canon Law, with the interpretation of the Italian State of Article 23, sub-section (2) of the Lateran Treaty, according to which, the civil effects of the judgments and legislative measures pronounced by ecclesiastical authorities and provided by this Article, shall be understood in accordance with the rights of Italian citizens as guaranteed in the constitution. a) The Italian Republic will ensures that the duty of proceeding with the conversion of church buildings shall remain with the ecclesiastical bodies, unless agreements are drawn up periodically between the competent government and ecclesiastical authorities in the event of particular circumstances. b) The Joint Committee, referred to in Paragraph (6), shall cease its work within and no later than six months from the signing of this present Accord. (c) the legal provisions in Paragraph (2) shall be applied also to marriages celebrated prior to this present Accord coming into force, as laid down in the norms of Article 34 of the Lateran Concordat and the law of 27 May 1929, Paragraph (847), for which a proceeding prior to civil judicial authority, as provided by the same norms, has not been brought. a) The teaching of the Catholic religion in schools indicated in Paragraph (2) shall be imparted – in accordance with the doctrine of the Church and with respect for the pupils’ freedom of conscience – by teachers who are recognised as suitable by ecclesiastical authorities, and appointed, with the agreement of those same authorities, by the school authorities. In nursery and primary schools the said teaching may be imparted by a class teacher, subject to recognition by the same ecclesiastical authorities of the suitability and willingness of the teacher to carry out the task. 5) the provisions of this Article shall not prejudice the regulations in force in specific regions in which these matters are subject to specific norms. The Italian Republic, in interpreting Paragraph (3), which does not alter Article 38 of the Concordat of 11 February 1929, will abide by judgement 195 of 1972 of the Constitutional Court concerning the same Article. The Parties shall work towards consultations with regard to implementing in their respective order the provisions of the present Accord. The present Supplementary Protocol represents an integral part of the Agreement which modifies the Lateran Concordat, signed at the same time by the Holy See and the Italian Republic. Published in AAS [Acta Apostolicae Sedis (Acts of the Holy See)] 77 (1985), pp. 521-546. ©The American Society of International Law. * This 1984 revision of the Lateran concordat is being used to excuse Italian clerics from reporting child abuse to the police. This is set out in the May 2012 child protection guidelines of the Italian Bishops' Conference (CEI). Under Italian law, the bishop, given that he holds no public office nor is he a public servant, is not obliged to report illicit facts of the type covered by this document to the relevant state judicial authorities.